A precious long baby night gown, from the 1920’s, made of a cream silk woolen fabric, which is a delight to touch. The home sewn gown is finely and expertly made, even though simple in construction. The gown is completely open down the front with the edges trimmed in a cream silk brocade ribbon. The detail of the blue feather stitch embroidery is exquisite. 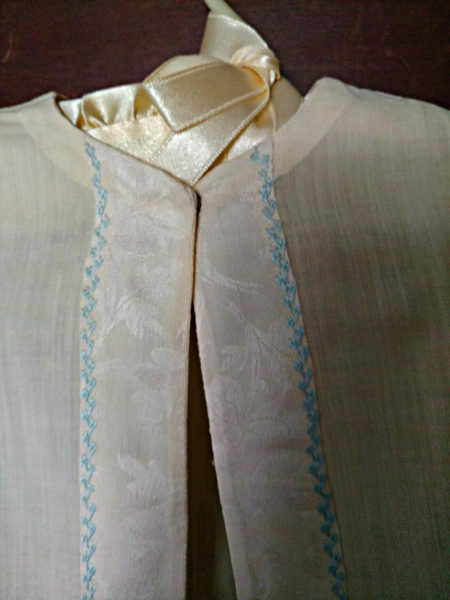 The cuff of sleeves are also trimmed with same delicate embroidery. One snap at the neck line to fasten.